AD offers Voluntary Counselling and Testing (VCT) services to all members of the community in an easily accessible and highly confidential manner. For those who test positive, the counsellors make referrals to the local clinic for ART (antiretroviral therapy) and encourage them to join the support group at AD or with another network. 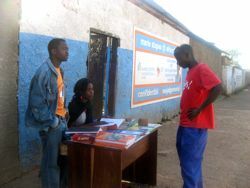 Peer educators & drama members help to sensitise the community on the the VCT process & the importance of knowing one’s status.